Reagan…..CH. 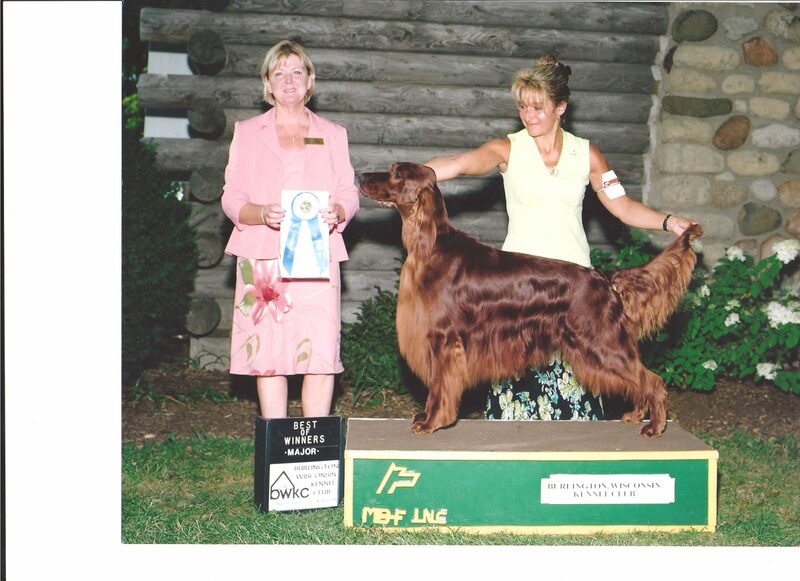 Piperbrook’s Forever A Star, finished his AKC championship with all majors, at the age of 3, winning 13 points his first weekend out in July at the Wisconsin cluster, 5pts. at the Specialty, then back to back 4pts. We took the summer off and showed him in October in NJ. and another 4 points, and he was finished and was only shown in 5 shows……He sired our first litter in 2010 with Orchard Farm Lace of Erinshire. 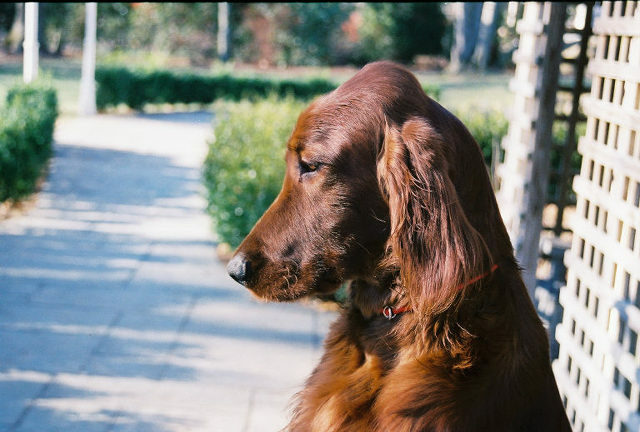 Reagan was without a doubt the reason that I decided that I wanted to breed my own litter of Irish Setters. It took me almost a year to research and find the kennel and breeding program that I would take to become Erinshire. 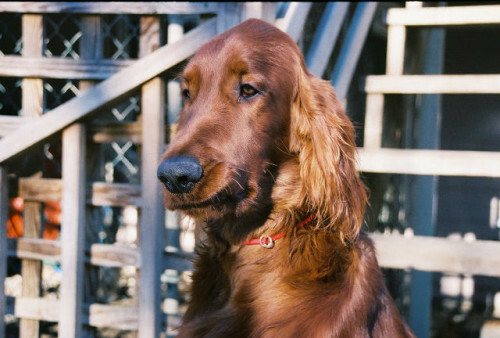 It was his pedigree that lead me back to Canada and the Irish Setters that I wanted to bred. Eventually, I found what I was looking for in Orchard Farm Kennels. I purchased Orchard Farm Lace to Erinshire “Erin”, from a litter a litter bred by Mary Klinck and Debra Davis. Not surprising that the “Erin” pedigree had Canadian and American bloodlines, as was Reagan. They would be breed and produce the litter “Forever” (it took forever) that would give us Eliott, a Best In Show winner! and his champion litter sister, Scarlett. 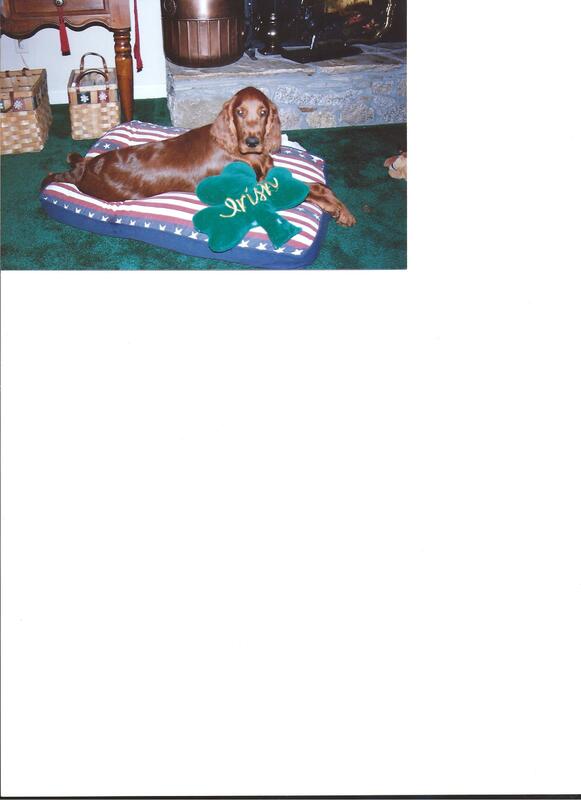 Reagan was my “heart dog” loved him like no other and he was such a lovely dog in temperament and confirmation…..When we lost him rather suddenly, I didn’t think there would be another like him, but Reagan gave us the best gift of all, just when we didn’t expect it, his son Eliott came along and filled the void.